There is, as has been pointed out, a lot of new ‘evidence’ that has caused ministers to re-open their consultation on plans for a new runway at Heathrow and it will all take a while to get to the bottom of. One issue of central importance not just to aviation but to the transport sector and local authorities in general is air quality, so that’s a good place to try to unpick what is going on. To get the clichés in early, the Government’s new, and already much-derided, national Air Quality Plan is a double-edged sword in relation to attempts to build a new runway, while the latest assessment of what a third Heathrow runway will do to air quality might be described as glass-half-empty dressed up as glass-half-full. 1.3.2 Taking into account the inherent uncertainties in air quality modelling there remains, however, a risk that the options could delay or worsen compliance with limit values, albeit decreasing over time. […] for Heathrow [North West runway] the risk is high (again until 2030 when the risk drops to medium). To translate: if everything is as we expect, things should be ok, but we can’t be at all sure. The first statement depends heavily on ministers’ new plan – as implemented by London mayor Sadiq Khan – working, while the second adds the further qualification that it’s still pretty uncertain. The test that the (2012-15) Airports Commission applied was whether a new runway would make the UK non compliant with EU limit values – an approach that was widely criticised. The Commission pointed out that all the time the UK somewhere (i.e. 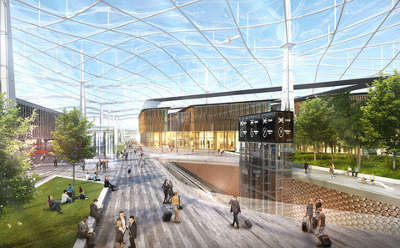 elsewhere in London) is projected to be non-compliant, a new runway at Heathrow would not make us non-compliant. The new assessment asks whether a runway option would make a zone (i.e. London) newly non-compliant, whether it would delay compliance, and whether it would make pollution worse in some areas within a zone, albeit still lower than an exceedance elsewhere in the zone. All of these represent a potential fail for an option. The double-edged sword that leads to the risk of a fail, at least on the last two tests, is that what is going on elsewhere on the roads is making things better. 1.3.5 Both Heathrow options increase pollutant concentrations on roads across London, including the roads giving the highest concentrations in the Greater London zone in the PCM modelling. Whilst this increase is small in magnitude, the opening of any option between 2026 and 2030 is coincident with the period over which the Greater London zone moves from non-compliance to compliance in the PCM model projections. As such, concentrations alongside some roads in central London, including the key A40 Westway, sit at or close to the limit value in all years and emissions scenarios and the small impact from airport expansion risks worsening exceedances of limit values on some routes or delaying compliance with limit values. A new Heathrow North West runway could well open in the middle of the next decade and could well generate an increase in flights very quickly. But if plans for low emission and zero emission zones work, it should all be fine. ‘Should’ again being the operative word. All in all, it’s a pretty arbitrary way to look at it – not just because the Government is applying rules that it will not necessarily be bound by after Britain leaves the EU but because it is so difficult to predict so far ahead how close we will be to breaking those rules, even without the new runway. 5.3.4 The critical link in all years is the A40 (Westway, 70181) in central London – over 15 km away from the airport boundary. On this road, the impact of the airport is small and the risk of noncompliance is determined to a large degree by the magnitude of the PCM model projection rather than the magnitude of the airport impact. On the critical link, the impact of the airport is small and related entirely to highway trips to the airport. The impact of airside emissions on the link, and on the compliance risks for the option overall, is negligible. As this implies, and this makes the assessment even more arbitrary, there are even worse impacts at other places in London – i.e. on the A4 near Heathrow, where the impact is five times as high – but these negative impacts are discounted because the projected levels of pollution with and without the extra runway duck under the current limit, while nevertheless being harmful to human health. Will a new runway at Heathrow make air pollution worse? Undoubtedly. Is this impact enough for it not to be built? You decide.